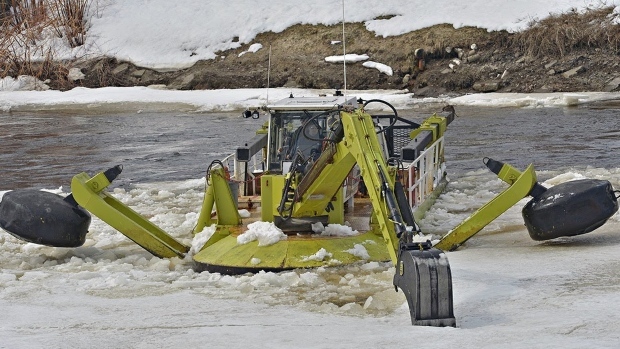 Crews operate an amphibious ice breaker, nicknamed a grenouille, on an ice-clogged river in Quebec. 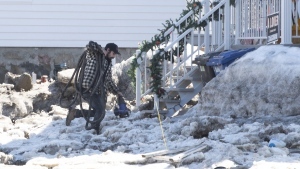 The city's Civil Security department has dispatched crews to closely observe water levels, and on Sunday an amphibious ice-breaker began to clear ice on the west side of Ile Saint Jean, near Highway 25. A pedestrian tunnel underneath Highway 25 has also been closed. The City of Terrebonne said it is taking action before the next storm, which is expected to bring more snow and could cause the river to rise to an even higher level. Officials said the fire department and police have also been alerted to the threat posed by the river. Citizens are being told to consult the website for the city of Terrebonne, or to call 450-961-2001, for the latest developments.